This afternoon I planted casaba melons in a big empty patch in the middle of our orchard. This is the second year that I have planted casabas—they were such a favorite with General Bidwell that I had to try them. I would have planted them sooner, but the weather has been too cool up until now for the seeds to sprout. I got my seed from Seed Savers Exchange I don’t know of any other catalog that carries it. They are wonderful melons, juicy and delicious, with a heady aroma, but they take a long time to grow. 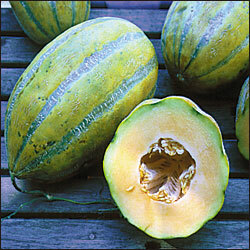 Seed Savers Exchange lists the seed as Bidwell Casaba Melon. The packet description says, in part: “Grown by John Bidwell (1819-1900), a Civil War General and U.S. Senator who procured his stock seed from the USDA in 1869.” The statement is partly erroneous and partly misleading. John Bidwell did serve as a brigadier general in the California State Militia during the Civil War, but most readers would assume that calling him a “Civil War General” indicates that he served in the U.S. Army. He was not a senator, but a congressman. And he did not acquire the seed in 1869. It was sent to him in 1881 by the Department of Agriculture, who knew how he liked to experiment with new crops. The melons grown in 1881 were such an outstanding success that Bidwell decided to devote 10 acres to them the following year. Hope mine turn out as good this year! This entry was posted in Casaba melon, Uncategorized. Bookmark the permalink.